Well, you’re wrong. And I assert that as politely and with love as I am able. I say this because I love you and look out for your well-being.Vegetables are good for you. I don’t tell you this because I think they’re good for your health – which they are – but, rather, I say this because you need to know that they are good for your soul. This past weekend, the weather finally resembled what fall should be. The drop in temperature was gradual and the skies were sunny and clear. There was a slight, crisp wind that carried my steps and by the time I made it to the grocery store, I was filled with fall sentiments. So much so that I bough some fall squash. The ones I chose were Delicata and Honeynut. They had such beautiful skins that I had thrown them in my shopping cart before I really knew what I was doing. I’m a dangerous shopper that way. My wallet and my meals are dictated my aesthetic temptations rather than practical ones. I’d honestly rather shop for beautiful food than clothes most days. Anywho – I decided that I had an excess of mandarin oranges at home and ought to use those up somehow. 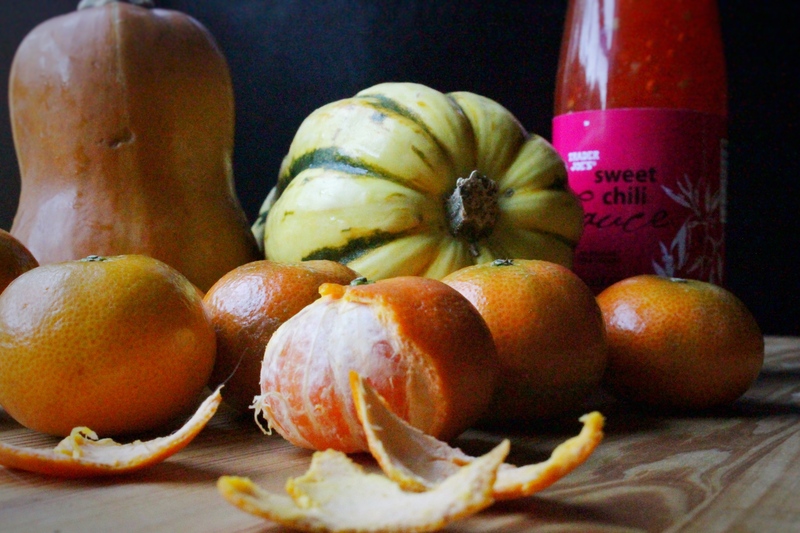 The sweetness from the oranges paired with the starchy saccharine nature of the squash would go well together, I thought. I added sweet Thai chili sauce for a bit of heat and soy sauce for a smidge of savoriness and proceeded to shamelessly devour an entire bowl with rice all while standing up in my kitchen. 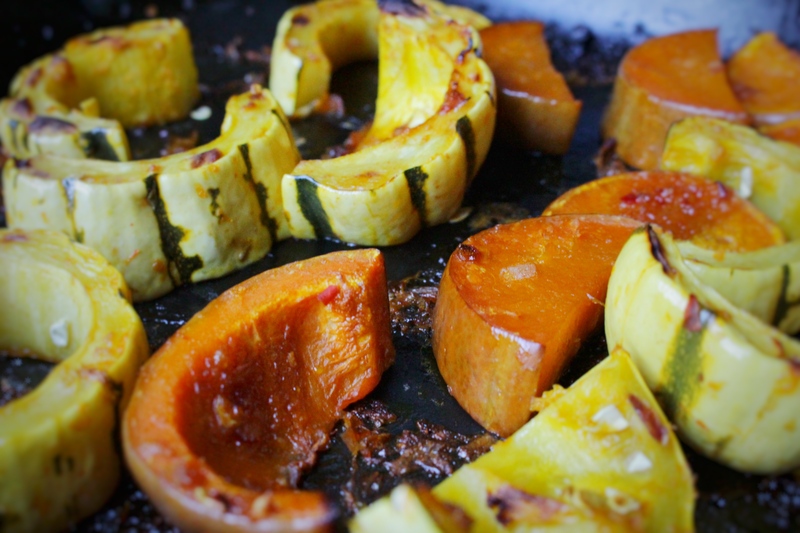 Truly, how can you resist an entire pan of burnished, beaming fall squash. Their crescent moon shapes are almost as if they’re smiling at you. Just an aside – if you find vegetables to be unworthy of being the center of your meal – well, you’re missing out. Furthermore, my greediness will be satisfied over your stubbornness. 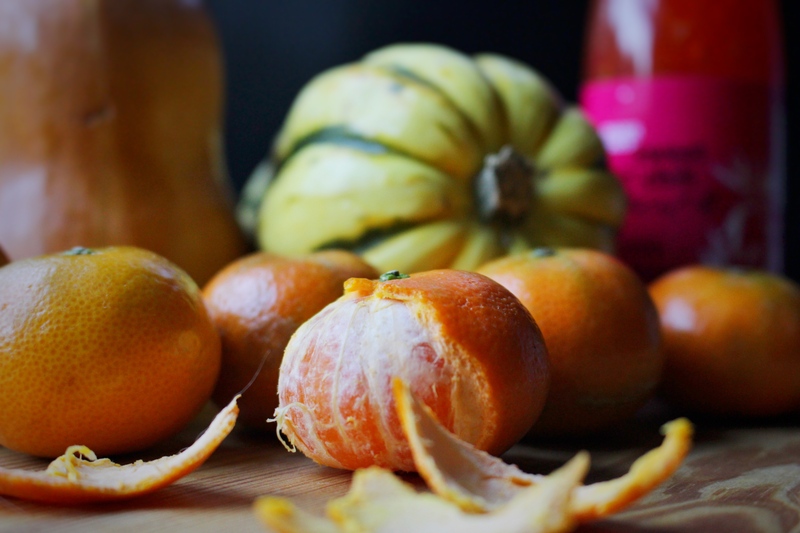 Preheat your oven for 425 degrees F. Put the soy sauce, the chili sauce, the mandarin oranges, onion, garlic, lemon juice, salt, and pepper in a food processor or blender and blitz until combined. Set aside. Slice your squash in half and scoop out the seeds. Cut the squash into half-moons around an inch thick. Toss in the tbsp of oil and put onto a baking dish or large skillet. Spoon half of your mandarin sauce on top of the squash. Put into oven. 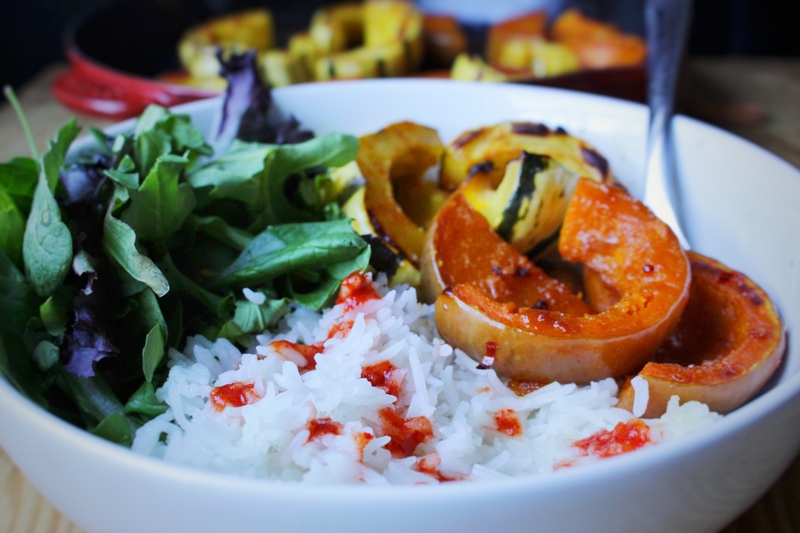 Half-way through the cooking time, spoon the other half of the sauce on top of the squash. Broil on high for the last two minutes so that the sauce caramelizes slightly. Squash is done cooking when it is fork tender. Seriously. Don’t be shy. Also – the bowl shown above is only of one helping. Greed is only deplorable when it comes to money and animal hoarding. Enjoy! All these beautiful photos were taken by astronomically talented Nick Wilkins. Follow him on instagram @wilklens.